At the library, my eyes are always way too big for my strength and free time. 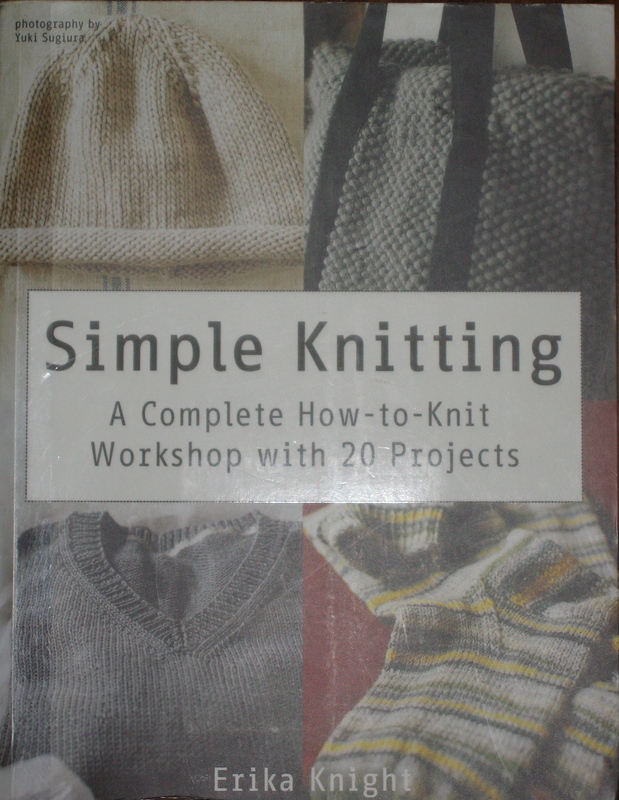 My armload of books on one recent visit included Erika Knight’s book Simple Knitting: A Complete How-to-Knit Workshop with 20 Projects published in 2011. 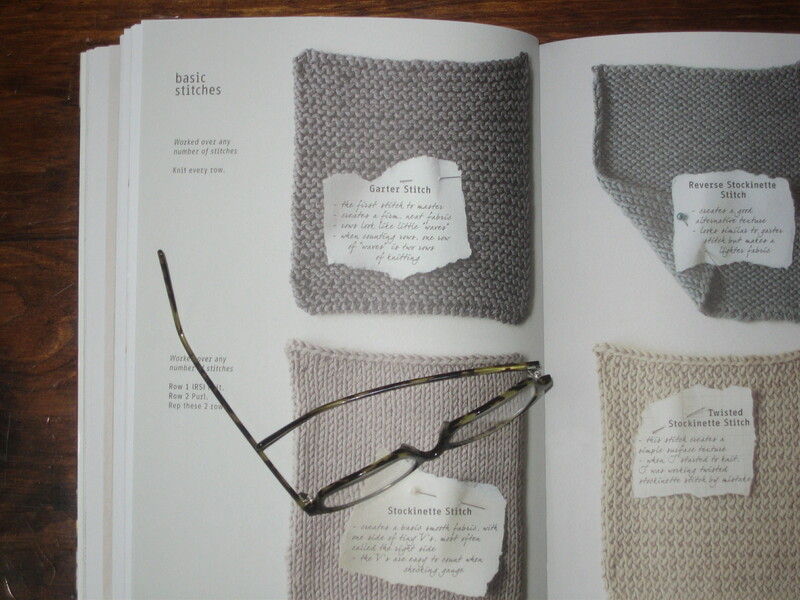 The classic knitted designs made with gorgeous yarns, beautiful photographs by Yuki Sugiura, the simple but clear illustrations, legible typefaces, the paper the book is printed on, and the text all combine to create this feeling of calm – definitely not the vibe I typically give off when knitting – and simplicity. Great photographs and descriptions of individual stitch patterns. As a big fan of Eileen Fisher clothing (but an owner of few pieces) and cardigan sweaters, this sweater really spoke to me … I might just knit this sweater over winter. Make sure to click on the links above for more inspiration from Erika Knight (her blog is here) and Yuki Sugiura. 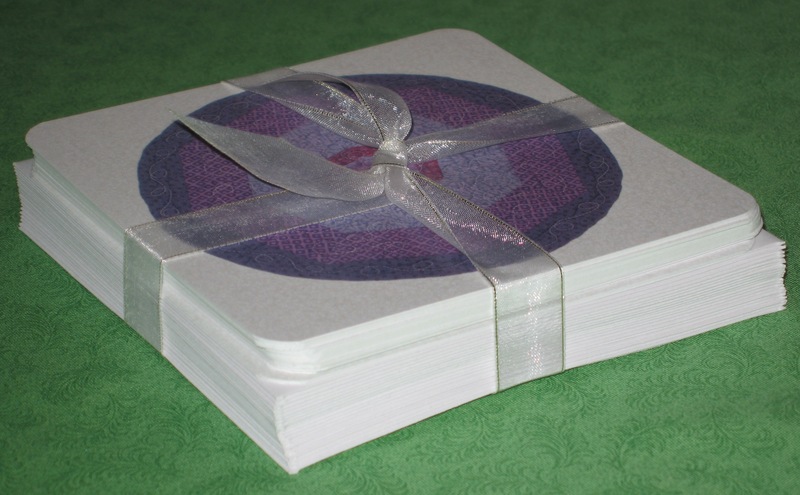 While quilting is my main passion, I do like to play in other sandboxes, so to speak. Taking a class now and then in embroidery, needlepoint, knitting, gardening or some other area that focuses on design principles and/or new techniques is inspirational and often leads to new ideas for my quilts. Soooo, when a local shop announced they would be hosting a day-long workshop a few blocks from my home with a world-renowned craftsperson, I was one of the first to sign up and pay my $90. I then purchased my supplies ($97.02, excluding tax) and counted down on the calendar. It felt like Christmas in a way and as I thought about the upcoming class, my expectations about what I might make with my newfound skills grew each day. A side note here: The workshop was to focus on teaching about color and two techniques. I had zip experience with the two techniques, but according to the course description, this class required only the basic skills, which I have. I have a fairly good understanding about color, but am primarily self-taught, so I feel there is always room to learn more. Okay, you know this is not going to turn out the way I envisioned, right? What I had not anticipated when I walked into the classroom all eager to learn was an instructor who, in my opinion, was far less eager to teach. Teaching is hard whether you are teaching rambunctious first graders or adults with a wide range of experiences and expectations. I have taught many students, colleagues, and clients through the years in my varying roles as a quilter and business consultant; and at the end of a workshop, I am wiped. Teaching in front of large groups does not come naturally to me, but I always give a 110% and make sure the content is on point with participant expectations. Whether you are teaching a craft or leading a workshop on how to write a business plan, many of the same basic rules apply. Most are common sense, but as I learned several days ago, not always followed. Here are a few I never lose sight of . . .
Write a clear and accurate workshop description that can be communicated to participants beforehand. This is what participants are going to read to decide whether a class is worth their time and money. 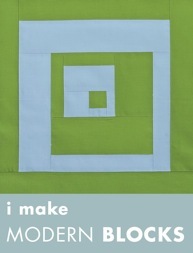 If this is a workshop where something will be produced (e.g., a quilt top, a sweater), show a picture. Keep this description close at hand as you outline the content since the description and content should match. Know your content. If you are not comfortable with or don’t have the depth to talk expertly about a topic, it should not be part of the agenda. Content should never be dumbed down because of the instructor’s lack of knowledge/curiosity, and the work of others who do view it seriously should not be discounted. Refresh your content. Who wants to be teaching the same class year after year. If you are bored with the content, it will not take long for that to become evident to your students. Think through the supplies list in any crafts class. Would it be more beneficial, from a cost and/or learning standpoint, for participants to buy a kit (possibly choosing from several color options) or to assemble the items themselves? Being mindful of students’ budgets can go a long way in building strong relationships, with the instructor and the local shop sponsoring the event. Hand out an agenda. Everyone wants to know where they are going throughout the day and what time parameters have been set for each item on the agenda. The course description should be reiterated here. Start the workshop with introductions, beginning with yourself. Participants should introduce themselves and state what they hope to learn. Write down these learning goals on a flipchart. As the instructor, this is where you need to manage expectations and amend the content – if everyone wants to learn a particular technique, show them, even if it wasn’t part of the original plan. If you skip the introductions or do them half-way through, you’ve missed an opportunity to manage expectations and it implies that you really don’t care who they are or what they want to learn. Revisit the goals periodically throughout the day to make sure you are working through the list. Lay out the ground rules about food and beverages during the workshop and apply it to all. As a coffee addict, I love being able to drink and sew, but only in my own studio where there is one cup of coffee and one person’s fabric stash to consider. Participants have invested in their supplies and to risk ruining them with a cup of coffee is simply disrespectful. In the class I took, the instructor’s coffee cup went flying at one point and spilled coffee everywhere. Luckily, it did not hit anyone’s supplies. However, the tone was set for what was allowed. When I moved a fellow student’s “filled to the brim with no top on” coffee cup to an empty table about 20 feet away from where people were working, she was slightly miffed. It had been sitting on the floor within inches of hundreds of dollars worth of her fellow students’ supplies! Make use of visual aids, including handouts and slideshows. This will help to reinforce the content and give participants something to take away and look at when they are at home. And, certainly don’t tell them to buy the book to learn the technique that they are supposed to be learning in the workshop. As an instructor, never be defensive or snappy. We’ve all heard it, “there is no such thing as a bad question,” and as the instructor you have to reinforce this. Wrap it up at the end of the day. Summarize key techniques and anything else you want to reinforce, check the list of key learning goals to make sure what you set out to accomplish has indeed been accomplished. Share participant’s work with classmates for one final learning opportunity. You may have done this on an ad hoc basis throughout the day, but do it a bit more formally now, giving constructive feedback by pointing out why something really works or does not work in the projects. Collect feedback on the workshop. When you are teaching, you need this feedback to know where you need to tweak content and make adjustments to your delivery. As a student, there are many times when you want to give feedback about what the instructor is doing right and where they could improve. It is especially frustrating when there is no means of giving this feedback after an experience that did not meet expectations. These are just a few ideas of what makes a great teacher – student experience in a workshop setting. What do you think makes for a great workshop? What makes a great teacher? What kind of crazy request is that? Well, this weekend I pulled out some yarn that I bought several years ago at Knitche in Downers Grove, Illinois, and knit up a scarf that I want to wear one time before it is stowed away till next winter. 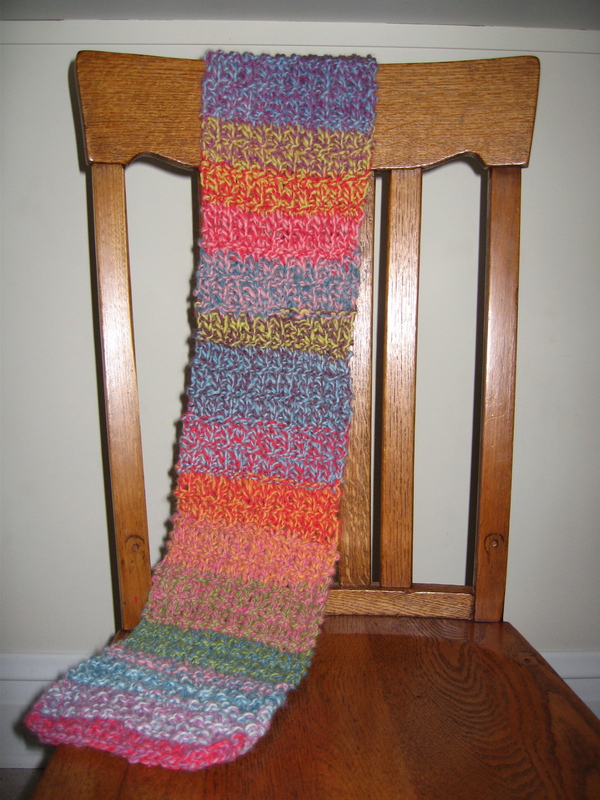 I wanted to knit a scarf on autopilot, but something other than a simple garter stitch. 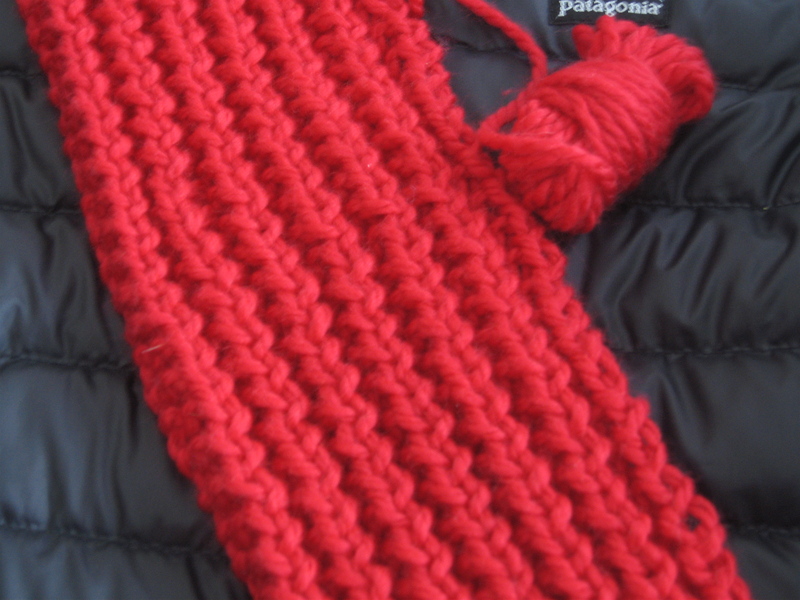 After looking through several knitting books, I came across the “hurdle rib” in Nicky Epstein’s Knitting on the Edge and decided to knit the entire scarf in this stitch pattern. In the sample swatch in the book, it almost has a cross-stitch effect. This effect was pretty much lost in my scarf, I think, because of the bulky, variegated yarn used. No matter because the scarf still, in my opinion, looks pretty darn good. The yarn is essentially two strands of different colors twisted together; of the two skeins used, there were only several color combinations that repeated. The hurdle rib should be used with an even number of stitches. Knit the first two rows and then knit 1, purl 1 for the next two rows; just repeat this four-row pattern until you reach the desired length. I wish I knew more about the yarn, but the tag had limited information: “Hand-plyed, natural dyed 70% merino/30% angora worsted/heavy worsted.” The gauge listed was 3 to 3.5 stitches per inch on U.S. needles sizes 9 – 11. I used two skeins of yarn and cast on 22 stitches on size 11 needles. 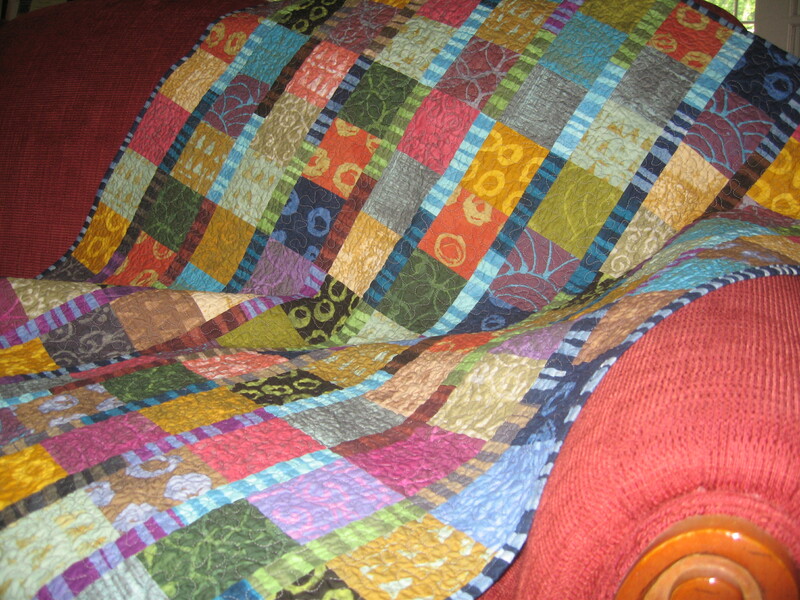 The finished scarf measures 42 inches long. Life threw a little curve ball a few weeks ago when my father had a heart attack, despite scoring relatively low on the risk factors. I am grateful to report, though, that his healthy eating and exercise habits before the heart attack are aiding in his recovery now. Since I needed a small, portable project at the hospital, I turned to knitting and started this scarf, a project that could easily and quickly be tucked into my purse if doctors came by, etc. I am loving how the basketweave pattern looks with this yarn, Ty-Dy Wool by Knit One Crochet Too, a soft 100% wool yarn. 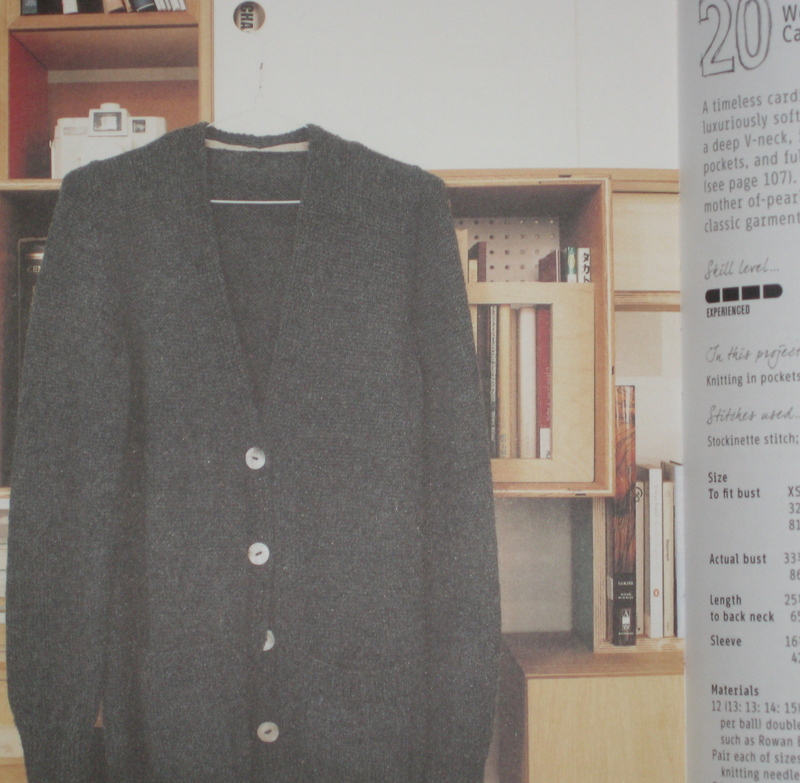 The look reminds me a of classic wool cardigan, the kind you might wear on a fall hike when the temperatures edge towards the lower end of the thermometer. I used size 8 needles and cast on 30 stitches. The scarf will definitely need to be blocked when it is finished. 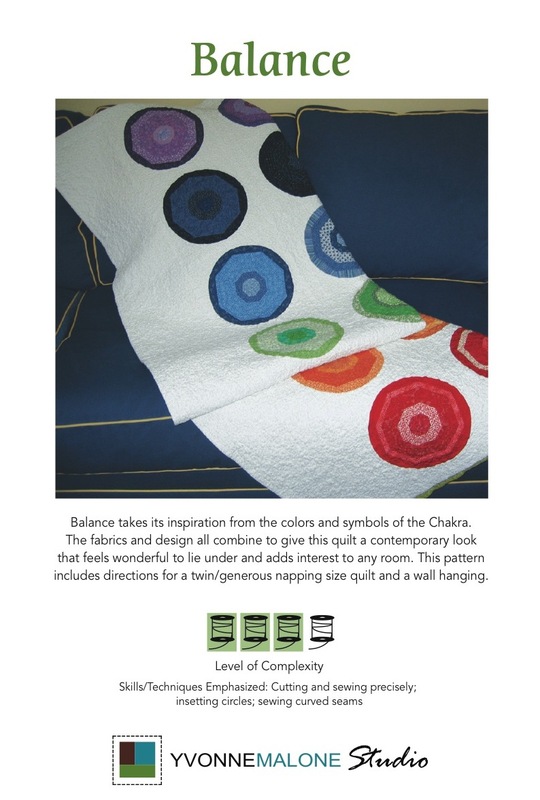 The pattern can be found at purlbee, a wonderful place to go for inspiration, ideas, and patterns. This is one site I routinely visit, intending to look for “just a few minutes” and before I know it, a half hour has passed. With life a bit more calm now, I will take the cover off my sewing machine and get back to test driving those books I mentioned in my last post. Halloween is behind us and winter is in the air on these chilly mornings here in the Midwest. This is the time of year when I pull out the yarn and knitting needles and start knitting scarves — one or two to keep, the others to give away as gifts. Last year I walked into the local knit shop, Knitche, and saw this totally fun scarf on display and immediately signed up for the class. The free pattern, “Latifa”, is designed by Jillian Moreno and is available here on Knitty.com. The entire scarf is worked in a garter stitch; when you are finished knitting the scarf, you go back and add the ruffle. I have knit for years but have to admit I still feel somewhat like a beginner — if I’m knitting anything more complex than a garter stitch I need the room quiet. What I discovered in this class, however, is that the details, like the ruffle here, can make whatever you are knitting look a lot more difficult than it actually is. 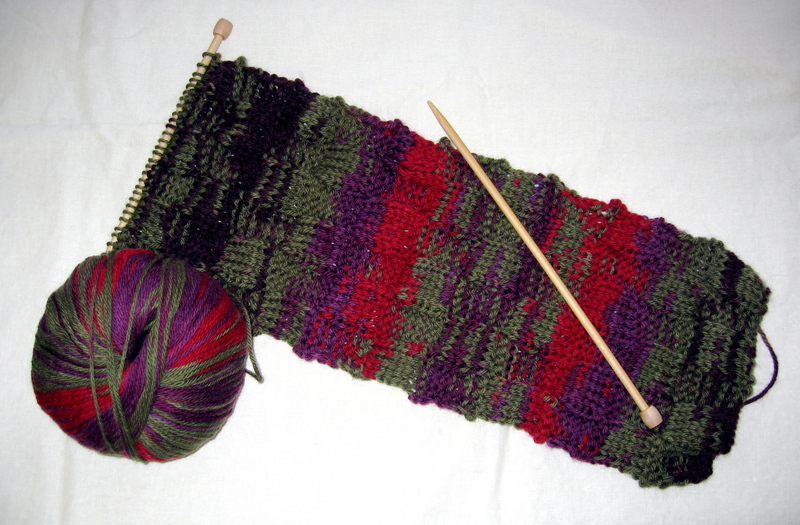 Scarves or blocks (that can later be stitched together for an afgan) are perfect for learning these techniques without becoming overwhelmed by the size of the project. I may never knit a Kaffe Fassett sweater, but I will build a repertoire of interesting stitches and details to use when knitting all of those scarves. A couple of other great resources for expanding your knitting knowledge are Nicky Epstein’s books, such as Knitting on the Edge, and Lesley Stanfield’s 100 Flowers to Knit and Crochet (great fruit, too!). 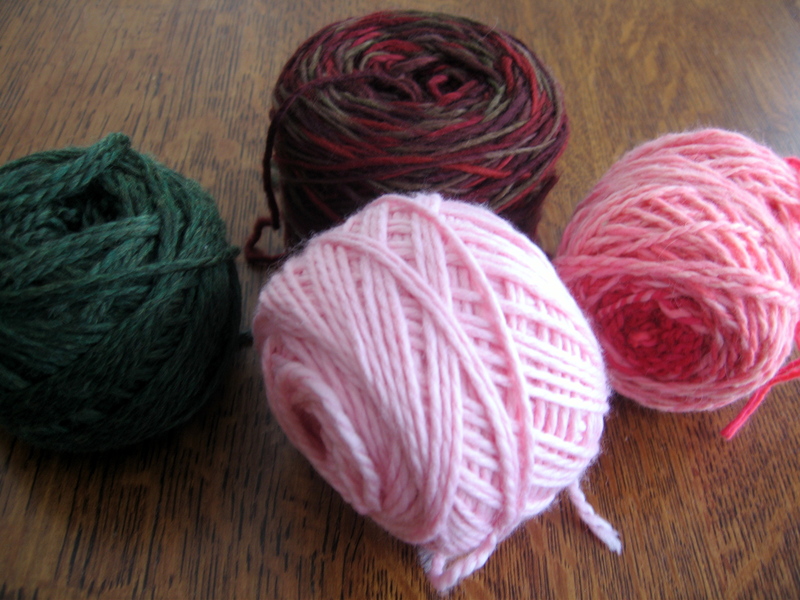 A quick note about my scarf versus the one on Knitty. This was such a simple scarf to knit that I went on autopilot; it was not until I put it on that I realized the scarf was four squares shorter than the pattern! I ended up liking the length just fine, so decided not to go back and add to it.